Let us guide you into the most refreshing siesta ever! It’s tough being an urban warrior, right? 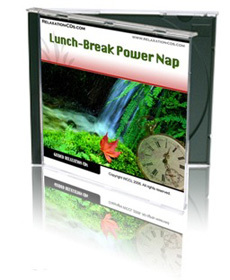 So with the aid of this de-stressing CD, recharge your batteries after your morning’s work, and return revitalized for the afternoon. With the help of our guided visualization, you’ll picture yourself in a beautiful rainforest lagoon. Around you tree ferns sway gently in the lightest of breezes. Exotic birds swoop overhead, while below multi-colored fish undulate through the crystal clear water. A waterfall tumbles into the lagoon, sending showers of sparkling droplets into the air. It all looks too tempting, so you take off your clothes and dive in. The water is cool and refreshing, and for a few minutes you simply savor the sensation of being here, in this perfect place, without a care in the world. Relaxed, refreshed and invigorated, you’ll be back at your peak for the whole afternoon – and beyond!